When I was still months away from giving birth I got to talking to a woman in line at Trader Joes. She asked me when I was due and I told her I had some time to go. "They're twins so I just LOOK like I'm about to bust open all over the scene." "Twins? I'm a twin, too!" she told me. And then went on to say that she and her twin sister just moved to LA together because one of them got a job and they couldn't NOT live in the same city. "Or apartment," she said. "We sleep in the same bed, too," she said, whispering. "I have a hard time sleeping alone. 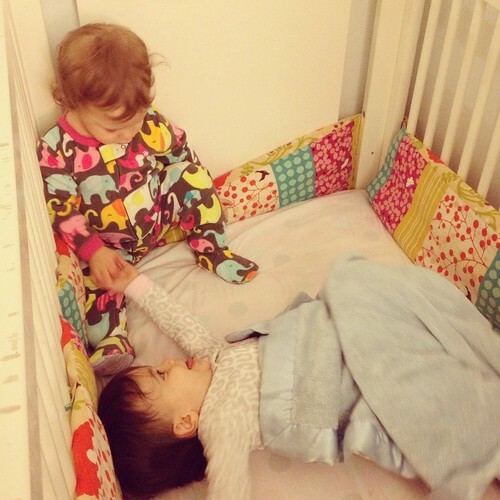 My mom used to put us down in separate beds and in the morning we'd be together." They went to college together, were roommates throughout, have never spent more than a few days apart. Ever. "We fight all the time," she said. "We are sisters. But we're also... I don't know." she said. "We're something else, too. You'll see." This conversation made a lasting impression on me -- the idea that I was carrying soul mates - that the girls growing inside me would be an inseparable duo, that they would come out of my body practically holding hands and never, ever let go. Except that was not the case. They barely acknowledged each other the first six months. And although they do interact and have for some time, they aren't wrapped around each other like puppies. When one gets hurt the other doesn't cry. Not usually, anyway. They're sisters like Fable and Bo are sisters. They're siblings like Revi and Archer are siblings. That's what I think most of the time. That what the girl in line at Trader Joes had with her sister was something very unique to her own life experience and that my girls, although close, won't be dependent on each other the way I anticipated they'd be. That was, until recently, when out of nowhere, Bo started seeking out toys to give Revi. 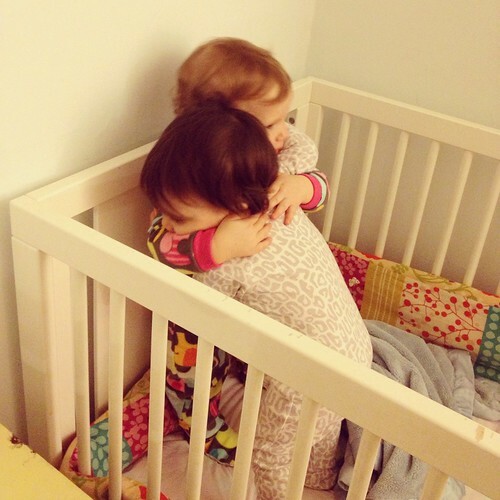 Or I'd wake up to their early morning conversations, back and forth between cribs. 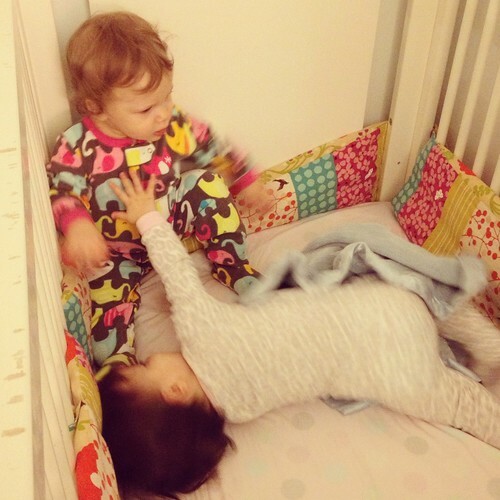 Or when Revi started tackling Bo with hugs and Bo started handing Revi the food off her tray - their partnership forming, their relationship suddenly very much their own. This morning Revi tried to take Bo's puzzle piece away from her so Bo went and got Revi her own. She climbed down off my lap, walked across the room, picked up a puzzle piece and brought it to Revi, beaming. And then? Revi said thank you. SHE SAID THANK YOU! Sure, it sounded like "noo noo" but it was totally and absolutely a thank you. It was like witnessing the first of many "We're in this together, girl" moments and it broke me. In the best way possible it shattered me to smithereens. I have no idea the kind of sisters they will become - whether they'll be roommates as adults, or best friends or just sisters who love each other. I don't know if their bond is special because they're twins. I like to think that there was a reason they were put on this earth together at the exact same time, in yin yang bodies with yin yang souls, complementing each other with their mismatched ways. "They don't even look like sisters," everyone says. "You don't even look like sisters!" But they are. They are sisters in a way I will never understand, which I think is what the girl at Trader Joes was referencing. ...before promptly exploding with the kind of joy/love/how is this even happening grateful overwhelmingness that can't help but occur during moments such as these. And yes, I very much see. This is amazing. It made me tear! While my boys are not twins, but 13 months apart (2 1/2 and 3 1/2), I see a much different relationship between them than I did between my girls who are 4 years apart or between the girls and boys. 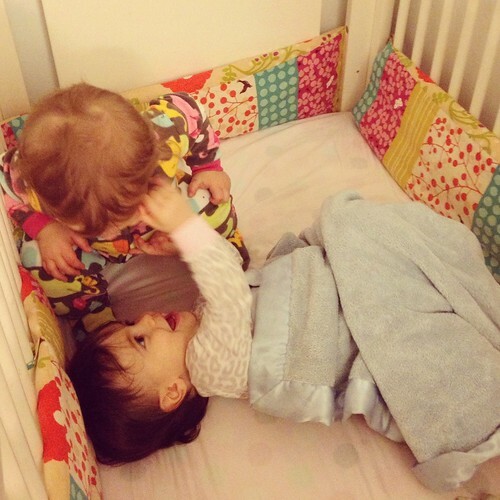 They are the two youngest kids in our lives, and it's so cool that they always have each other. I love listening to them play. The silly conversations they have. Them being considerate of one another. They understand each other and stick together, and I love being able to watch it. I have 18 month old twins girls and I am sitting here trying to figure out the right words to say in response to your touching words and pictures. I guess it is as simple as we very much see at our house too. The connection is magical. My twin boys are almost 14 months. They have a very similar relationship to your ladies. Despite my best efforts to encourage that magic twinship they've only just begun to interact. I've adjusted my ideals. Now my hope for them & their older brother is that they love each other as only brothers can. I'm an only child and I hope they have the kind of relationship I've only dreamed of. I'm sure their dynamics and relationship will continue to change and evolve into something special...unique...ying yang. your girls' story brings happy tears to my eyes. 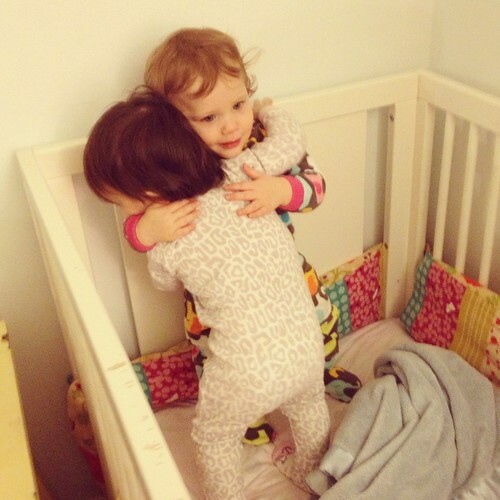 My two younger sisters have this bond I had always been jealous of as a child. I am 3 years older and always felt like an outcast around them. Inside jokes, smirks, this language I never got to master, having to drive them around as teenagers whispering in the backseat, etc. Now, on the eve they will turn 30, I am grateful I got to witness that bond as we all get together with our baby brother, 7 years my junior, thankful we all have each other in our lives. this makes me wish my sister an I were twins (though I'm very grateful just to have her). sisters rule. Bo and rev are perfection. Siblings. How true. Though they may not know it yet.